On Saturday, June 6, SSB raised $967 at a car wash in Camden to go to the club’s treasury. This money will be used to give back to the club’s members and community by doing things like buying trophies and banners for use at the Preble County Fair. SOMERS TWP. 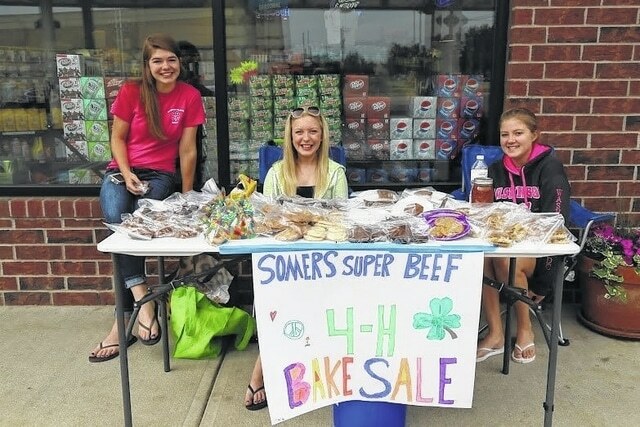 — The Somers Super Beef 4-H club is excitedly starting another year of 4-H. They elected officers at a recent meeting, and are proud of the great team that was chosen. This year’s officers are President Alyssa McQuiston, Vice President Branden Giffen, Secretary Carley Asher, Treasurer Aubrey McQuiston, Reporter Katelyn Niehaus, Health and Safety officers Tristen Sizemore, Aaron Deaton, MacKenzie Neal, Kelsie Asher, Carlyn George, Libby Giffen, Sydney Jolley, Megan Rader and Chaz Smallwood. This officer team is looking forward to another great year in 4-H and hoping for much success and fun at fair. Another important part of Somers Super Beef 4-H club is its advisors. They are always supportive and helpful to the club’s 4-H members. The club’s lead advisor is Gayle George, now an advisor of this club for 38 years. The assistant advisors are Tim and Patty Gutherie, Taylor Hobbs, Bill and Keri McQuiston, Bill and Susan Miller, Suzy Cottingim, and Harold Niehaus. They can’t wait to see what the club’s 4-Hers have in store this year. On Saturday, June 6,the club raised $967 at a car wash in Camden to go to the club’s treasury. This money will be used to give back to the club’s members and community by doing things like buying trophies and banners for use at the Preble County Fair. Some members of the club also went to 4-H camp on June 7-11 and had a great time participating in the Back to the Future-themed camp. On June 8, members helped to set up gates in the Beef Expo Center. The club’s members are actively preparing for fair and hope to make it another great year for the Somers Super Beef 4-H club. CAMDEN — Camden Country Kids are taking meat and dairy goats, pigs and horses to the fair. They are discussing t-shirt designs for club members. They will be working with animals all summer long to get them ready for the fair. They are learning to take care of our animals and show them properly. A booth will also be set up this year. They will be painting the goat barn to get it ready for the fair. They are all excited for this fun activity. It will be a lot of work but a lot of fun. Once fair comes, we will be ready for anything. So, please join us at the Preble County Fair on August 1 to August 8.